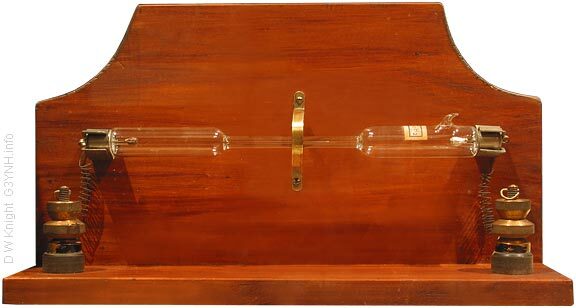 Capillary spectrum tube, ca 1930, labelled C2H2 (acetylene). This item is in the collection of the Porthcurno Telegraph Museum. (where it is catalogued, somewhat generically, as a "Crookes Tube"). The narrow middle section eliminates the need for a slit-collimator when examining the light output with a simple prism or grating spectroscope (it also ensures high brightness when a slit is used). This type of tube, with a wide choice of gas fills, is used for teaching laboratory demonstrations and is still readily available (cost ca. £20 - £60 UK inc. VAT from educational suppliers). www.eiscolabs.com/ Eisco scientific online catalogue . www.betterequipped.co.uk/ [type ' spectrum tube ' into the search box].